After a pre-tour brief this morning, we take you on a tour of Kathmandu. As well as visiting the Temples and Palaces around Durbar Square, we'll also take you to visit the Swayamabuth stupa whose many steps take you to the top from where you are rewarded with incredible views across the city and the rest of the Kathmandu Valley. In the evening, you are free to browse the local shops and fine restaurants. We leave Kathmandu this morning and travel overland to Syabrubensi where you'll begin your Langtang trek. The town lies at the junction of two well known rafting rivers – the Trisuli and Bhote Khosi. 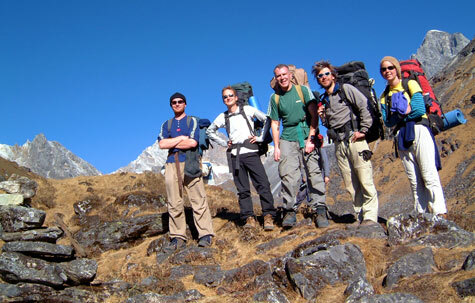 Your first day of trekking is mainly through rhododendron forests as you follow the Langtang Khola. There are good opportunities to see wildlife today including Langur monkeys. Overnight at Lama Hotel. The forested paths continue as you climb to Ghora Tabela. The valley then begins to widen and you trek passed a Buddhist Monastery before arriving in Langtang village. You'll have some excellent views today as you continue your trek. You'll have the chance to see the Langtang Lirung glacier and the ice fluted Gyangchempo before you start the descent into Kyangjin Gompa. Over the next two days you have the chance to continue hiking up the valley to Nubamatang and Langshisha Kharka, where you can see the glaciers that mark the gateway into Tibet. There is also the opportunity to climb up to Tsergo Ri (5033m) which offers unrivalled landscape views. Today you'll retrace your steps back down the Langtang Valley from Kyangjin Gompa back down to Lama Hotel. Today you'll follow the Langtang valley, crossing the river before ascending to Thulo Syabru. You leave Thulo Syabru early in the morning and follow the hiking trail through thick forests. The climb is long and slow but the views of Ganesh Himal are superb. You should reach Sing Gompa by the end of the day. Today you'll follow a ridge with more incredible views of the mountains and the Tibetan plateau. You then trek down to Gosainkund – a sacred Hindu lake which is very popular with pilgrims in the summertime. You'll start to climb upwards today as you cross the Llaurebena Pass which at 4610m marks the highest point of the trek. From here you can see the Annapurna range, Manaslu and Ganesh Himal. The trail then starts to descend as you make your way to Gopte/Dobie Char. Today the trail climbs again as you pass through large Oak forests before arriving in Tharepati. The views are again spectacular, particularly those of Langtang. You then travel through the Helambu valley to the village of Gul Bhanjyang. From Gul the trail drops down to Pati Bhanjyang and on to Chisopani. It’s a long walk today through the forests but the trail offers great views of the Kathmandu basin. Finally, you arrive in Sundarijal where we transfer you back to Kathmandu. We leave today as a free day for you to recover from your trek or do some local sightseeing. We can arrange a trip to nearby Patan or Bhaktapur, or even sort out a mountain flight over Everest.